With the economy putting the focus squarely on providing as much quality for the lowest price possible, wineries have been increasingly focused on value priced wines. The frequent refrain of late talking to Washington winemakers has been, “This is my glass pour wine,” – meaning a wine that can be offered at restaurants and bars by the glass for a modest cost compared to a winery’s standard offerings. The problem has been that, due to production costs, it has frequently been challenging for wineries to offer high quality, low priced wine. Until now. Keg wine has come to Washington State. Using a system similar to what has been used for beer, bars and restaurants have now started offering keg wine by the glass. These wines provide the opportunity to make the wine less expensive, fresher, and with a smaller carbon footprint. What is so appealing about keg wine is that the costs associated with bottling – glass, cork, and labels – along with the transportation costs are reduced. This savings can then be passed on to consumers, allowing people to offer higher quality at lower prices. It also has a positive environmental effect. While The Local Vine is currently offering two cask wines, Munson says, “We can offer pretty much any whites or reds that the wineries can provide us.” Bottlehouse plans to offer four wines through their tap system, initially focusing exclusively on red wines from Washington and Oregon. Schock says, “Eventually when there are more options, our selection will be constantly rotating. Once a keg blows, a different wine/winery will be there to take its place.” Schock also plans on contracting with winemakers to make blends specific to Bottlehouse. While the upside of keg wine is large for both wineries, retailers, and consumers, there are some concerns. 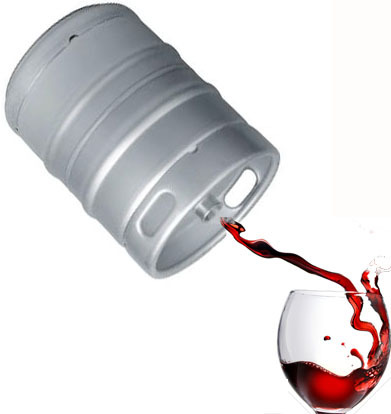 As keg wine takes off, the market can be expected to become saturated quickly. There will also no doubt be a race to the bottom on price with quality certain to be affected. What great news for wine drinkers! Hurray for the winemakers who will let go of their pricing ego and admit that wine doesn't have to be expensive to be good. Price is no guarantee of quality wine. A good wine value will be rewarded with loyal customers. This is fantastic news for wine drinkers! I am going to have to check out those wines for sure. Thanks for the great info!